(1) ATI support: Includes optimizations for the ATI Imageon 3200-series video accelerator when available (e.g. iPaq hx4700, Toshiba e800/e805, O2 XDA II). 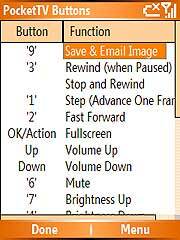 (2) Step: Allows stepping frame-by-frame to observe individual frames. 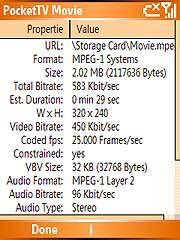 (3) Supports "odd" sizes: Some MPEG players do not play properly MPEG with "odd" size, i.e. 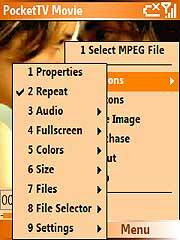 image size not multiple of 16x16. (4) 2700G support: Includes optimizations for the Intel Marathon 2700G video accelerator when available (e.g. Dell Axim x50v).